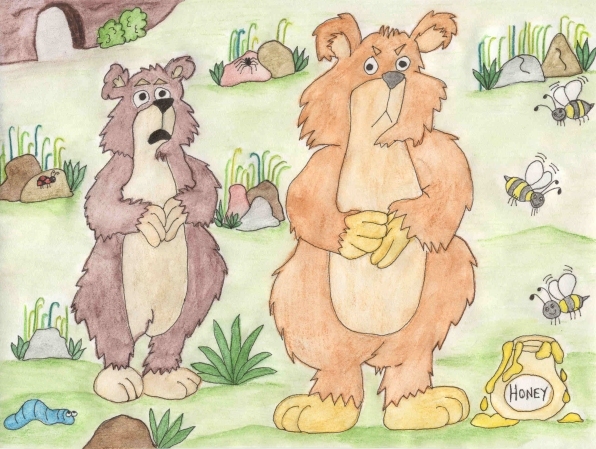 Finlay and Janet were two big brown bears that lived in a cave in the highlands of Scotland. Finlay was a much larger bear than Janet was but they lived in peace and harmony. During the cold winter months the bears stayed in their cave and slept. Winter in the highlands can be brutal. Icy winds blow and snow covers the ground, freezing everything in its path. But when spring comes, it’s another story. Streams begin to trickle through the meadows, flowers bloom and the air is full of butterflies and bumblebees. Bees make honey, and honey was Finlay and Janet’s favorite food. Their honey pot was empty because they’d yet to find any honey to put in it. One spring morning the bears went out of their cave to find something to eat. "It was a long winter," Finlay growled. "I’m starving. What is there to eat?" "We can go to the stream and find some fish," Janet suggested. "I don’t feel like having fish. Why don’t we grab the honey pot and see if we can find a beehive. My taste buds are calling for something sweet," Finlay said. He ran back into the cave and came out carrying the honey pot. They walked through the glen, looking at branches, between rocks, and anywhere else a bee might decide to build its hive. Finlay was getting grumpier and grumpier as they walked along. There were no beehives to be found. "Let’s forget about the honey and have some fish. If you don’t want fish, I saw some blackberries and hazelnuts growing in the woods," Janet said. "I don’t want fish! I don’t want blackberries and I don’t want hazelnuts!" he snarled. "Very well then. You stay and look for honey. I’m going to have some blackberries," Janet said and walked back towards the cave. Finlay walked up the hillside. It was then that he spotted the beehive. "Aha! I knew I’d find one if I looked hard enough." He grabbed the honey pot and put it at the bottom of the tree. Slowly and carefully he climbed up the trunk, being careful not to disturb the bees. He crept along the branch and sat above the hive. With a quick slap, he knocked the beehive off the branch. It fell to the ground and splattered open. Honey went flying everywhere. The angry bees buzzed around, not knowing what had happened. Seeing there was nothing they could do to save their hive, they flew to another tree and started building another one. Finlay waited a while, climbed down the tree, and filled his honey pot with golden sweetness. He licked his fingers. "This is delicious!" He carried the honey pot back to the cave. Janet was sitting on a rock eating blackberries. She had purple stains on her paws from the juice. "Finlay!" she shouted, "you found some honey!" "It’s delicious and sweet and amber-colored. I’d say it was perfect honey. By the taste of it, the bees used heather pollen. Come and tree some," he said. Janet stuck her paw in and licked the honey off. "It’s lovely." The two of them ate until they were full, put the honey pot down outside the cave entrance and went to lie down for a while. When they woke up, Finlay went to get the honey pot. He was surprised to see a swarm of bees buzzing around it. "You stole our honey," one of them shouted. "You knocked our beehive down and destroyed it and then took the honey for yourself." The bee was clearly angry. "Let’s get him!" it shouted. The bees encircled the bear. "Yikes!" Finlay cried. He ran as fast as he could down to the stream and jumped in. The bees tried to sting him, so he stayed under water as long as he could. Finally the bees gave up and left. Janet stood near the honey pot. "Where did Finlay go?" she wondered. She started eating the honey from the pot. A while later the angry bear returned to the cave. He was dripping from head to toe and had a few bumps on his head from where the bees had stung him. He looked at the honey pot. There was nothing left in it. Janet had eaten it all. Tired and worn out, he said, "Do you have any more blackberries? I think I’m giving up honey for a while." Janet smiled and handed him a paw full. "Not as good as honey, but at least I won’t get attacked," Finlay scowled and then tossed some more berries into his mouth.